RAIDERS OF ATLANTIS is one of the biggest genre duplicators to come out of early 80s Italian action cinema. If something was an international hit, it is most likely to be found at some point in here. 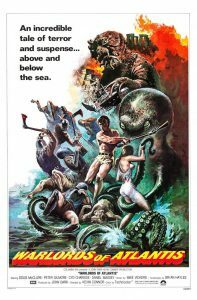 One need merely look at the US box office reports from 1979-82 to find the workings of this Ruggero Deodato flick. Assorted ingredients include THE ROAD WARRIOR, ESCAPE FROM NEW YORK, THE WARRIORS, FIRST BLOOD, RAIDERS OF THE LOST ARK, FOR YOUR EYES ONLY, FLASH GORDON, SUPERMAN: THE MOVIE, THE FINAL COUNTDOWN, and even a little NIGHT OF THE LIVING DEAD. But this is part of the fun of RAIDERS (and most Italian films from this era). Picking out what bit came from where is like a cinematic version of “Where’s Waldo?” For example, the group of survivors encounters a formally dressed family hiding out in an abandoned house. Hmmmmm? NOTLD perhaps? Of course, Deodato one ups his sources in some cases and has the family immediately become graphic gang fodder. This mishmash approach also allows you an opportunity to see which films had a huge impact on Italian cinema (let’s just say George Miller and John Carpenter should be pleased). uh, I mean Mohammed replies, “What’s wrong with circles?” This type of head scratching dialogue is abundant. Rounding out the cast are low budget familiars Ivan Rassimov, Bruce Baron and George Hilton doing his best “Clark Kent” as a nerdy professor. If you don’t blink, you can also catch appearances by future filmmaker Michele Soavi and Deodato himself. The budget is obviously low (watch for miniatures that would make Sid & Marty Kroft shake their heads) but enough bullets, explosions and mayhem (including a gruesome decapitation) is supplied to help you quickly overlook that fact. Plus, the film opens with the soooooo out of place but incredibly catchy disco theme “Black Inferno” by Oliver Onions (the pseudonym of the De Angelis brothers). Deodato seems to have completely thumbed his nose at the conventional rules of cinema, jumping from day to night and back to day in scenes that are supposed to continuous. Hell, what do I know, maybe things are like that in Atlantis?